Have you introduced your preschoolers to the Nutcracker yet? My daughter is a ballerina. That means this time of year is Nutcracker season in our house. She’s been dancing in the Nutcracker for the past seven years, and we’re gearing up for this year’s performance season. In honor of this year’s Nutcracker season, I created a fun preschool printable to kick off your holiday learning season. This fun Nutcracker preschool printable is perfect for your holiday homeschool lessons! Inside this free learning pack, you’ll find math activities, handwriting practice, letter hunts, and more perfect for your tots and preschoolers! If you have older kiddos who love the Nutcracker, check out this Nutcracker learning pack for K-5. Here’s a fun Nutcracker book list to check out, as well. Get your Nutcracker learning pack. 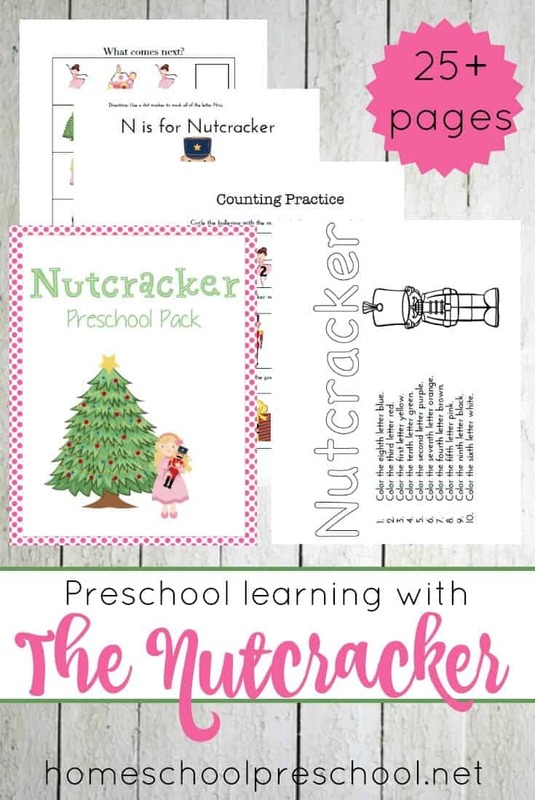 The Nutcracker Printable is ONLY available to Homeschool Preschool subscribers. Click the button below, enter your information, and then check your inbox for your printable. Little ones will enjoy painting their own clothespin Nutcracker crafts! Artistic preschoolers may enjoy learning how to draw a Nutcracker with this tutorial. I love all the different versions of these paper towel roll Nutcrackers. Preschoolers can use these popsicle stick Nutcracker puppets to retell the story all season long. Here’s a simple paper plate Nutcracker for tots and preschoolers. Kids can color this toilet paper tube Nutcracker template for a super simple craft. These jingle bell ribbon sticks are perfect for dancing like the Sugar Plum Fairy! LEGO fans will want to download this step-by-step instruction page so they can create their own LEGO Nutcracker. Here’s a fun printable Nutcracker cut and paste craft for your kiddos. Thank you for such a wonderful resource. I will be using the Nutcracker theme for the first time this year and you have saved me so many hours!